China Racing is no stranger to the motorsport scene, beginning 10 years ago in A1GP and going on to compete in the Superleague Formula and FIA GT1. Last year they became the second team to sign up to the FIA Formula E Championship and, as Team Principal Steve Lu explains, they are looking forward to getting started. What originally attracted you to the series? Team China Racing has been competing in various international racing since 2004 and we are always looking for new opportunities. Formula E is going to be a top level electric series and we are delighted to be able to take part. We are confident that we will be able to perform well given all the teams are starting on a level playing field. From a teams’ perspective, what are going to be some of the biggest challenges for the first season and how do you rate your title chances? Every team is starting from scratch and has a lot to learn in order to adapt quickly. As the second team to enter the championship, we hope we will have a slight advantage over the teams that joined later. Our selection of drivers for this year will be crucial and I expect our competitors to have excellent line-ups. I think the street race format should suit us and give us the chance to finish on the podium in some races. What has been the reaction to Formula E in China? Do you think the Beijing race will be very popular? Since the launch of our Formula E team there has been a lot of noise about the series in China. There are many questions surrounding the sound of the car, the battery unit and Chinese driver involvement. All the curiosity has generated an enormous response towards Formula E in China. Beijing is the best city to host any sports event with a population of over 20 million, especially when you have a home team to cheer for! You will find many spectators and fans are actually on the waiting list to buy an electric car for their families. This is the perfect time to see for themselves the reliability of electric vehicles. We need this change to reduce the pollution in the city. Would you like to see more teams from China competing? It would be nice to have other teams originating from China but not too many as I prefer a diverse championship. 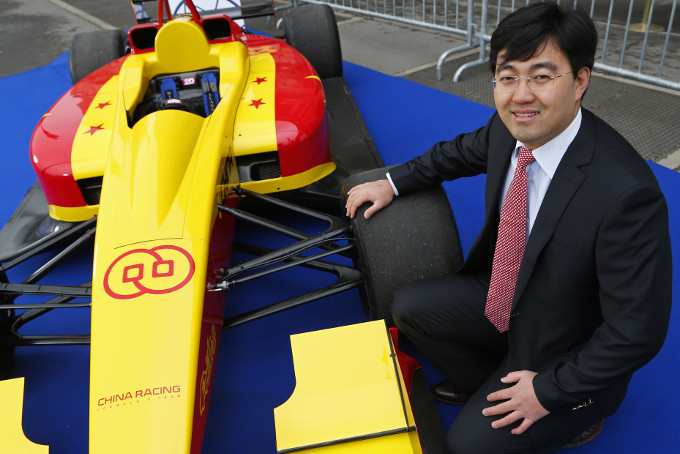 Does China Racing have plans to manufacturer its own electric car in the future and if so, what can you tell us about it? We will need backing from Chinese manufacturers to make our own cars in Formula E. Our plan is to first learn from the current Spark-Renault SRT_01E cars and hopefully reach an agreement moving forward with a local manufacturer. Any news on potential drivers? Will they be Chinese? We have many options and are in talks with drivers from various countries. Our intention is to field a Chinese driver but we are also looking towards reserve roles to help home-grown talent through the learning process.